OMA has several different platforms to stay connected with OMA news and network with fellow members. Here you can find information on the different ways that you can stay connected. Questions? Contact us anytime at OMA@ORMediation.org. 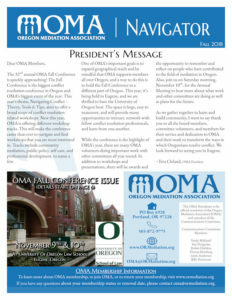 The Fall Newsletter–The OMA Navigator–is here! Print versions will be hitting member mailboxes this month. But we can’t wait to release it. Check out the pdf here. Stay up-to-date on all of the events at OMA. All OMA members receive the Flash, OMA’s email newsletter with upcoming events, trainings, and other news. Flashes go out the first week of every month and on an as-needed basis when there are major events. Interested in joining the email list? Sign up below. Are you a member and haven’t been receiving the Flash? Check your SPAM and make sure to add OMA@ORMediation.org to your safe list. You can also contact us at OMA@ORMediation.org and we can check to make sure that all of your personal information is up-to-date. OMA Member Listserv Now Open! OMA is excited to share a new Listserv project that will let OMA members communicate directly with each other by email. Members will be able to share information, opportunities, ask questions, and raise concerns with each other related to the practice of dispute resolution. Questions? Email OMA@ORMediation.org. Listserv basics, including how to use it, rules, and etiquette can be found here. Yes! Add me to email list ("Flash"). I understand that my email will not be shared with any outside group and that I may opt out at any time. Add me to the OMA Member listserv.